d. 17 Jul 1805 in Greiz, Thuringen, Germany d. ? The Wiegand name goes far back into the earliest beginning of Teutonic history. Wiegands are mentioned in the wars between the Tuetors and Romans, and Wiegands were warriors, fighters, and soldiers. Gerhard Wiegand, our ancestor, remembered reading about the Wiegands in the books of Gustav Freitag called the Anrein (ancestors), published in 1872. The name was spelled Wygand or Weygand, but pronounced "Wee - gand". The forefathers we know by name were all Guild Weaving Masters of linens, woolens, and cottons. The city of Greiz, where most of them were born and lived, was a very important textile center. As weavers, these families were mostly poorly paid people and lived very scanty, but "proud, decent, and honest" lives. Until about 1870, most weaving was a home industry on wooden hand looms, which later were changed to mechanical power looms that were installed in large factories. The Guild Weaving Masters lost their independence and became employees of the factories at this time. 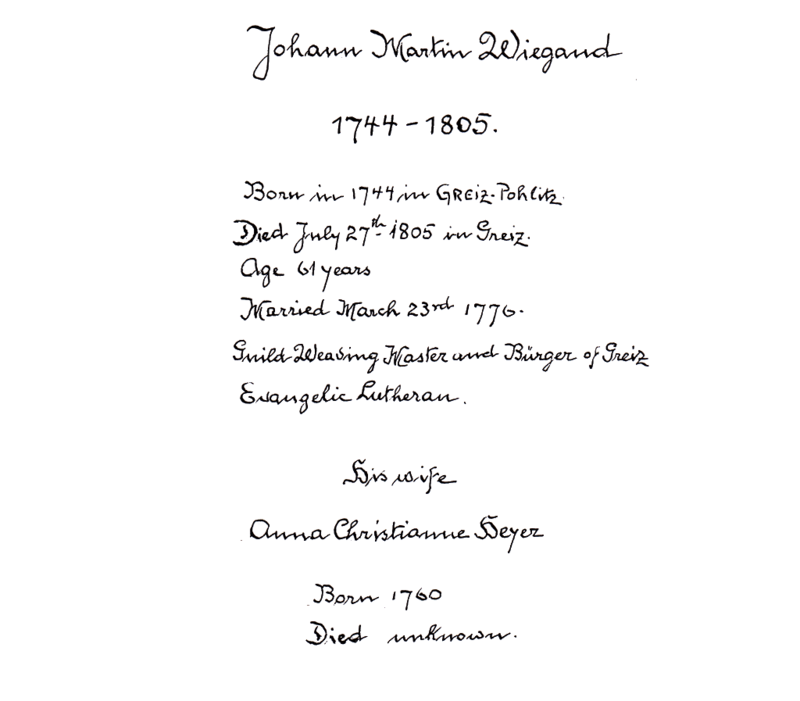 Johann Martin Wiegand married in 1776 (the year of the Declaration of Independence in the United States) when he was 32 years of age and his bride was 16. He was a Guild Weaving Master and Burger of Greiz. He was also an Evangelic Lutheran. Nothing more is known of his wife, Anna Heyer, than that she was bron in 1760.